Hi Mike, I need some help selecting which buffer will work best for my needs. I just bought a 2002 Proline 23 sport center console and it's in decent condition but could definitely use some attention. The sides of the hull arent too bad, they still shine minimally and if there's and oxidation i cant see it. The tops of the gunwales and the stern/transom however are in bad shape. There's little to no shine, they get stained very easily, and there's even some chalkiness in certain spots. I attached a few pictures to give you an idea. This buffer will be for personal use only. Ill be using it a few times per year on my boat and maybe once a year on my car. I have zero experience using a buffer and dont want to go overboard if i dont have to, but im not afraid to spend a little extra to get the right tool. Ive been looking at the marine 31 porter cable complete oxidation removal/polish kit as it seems the safest for the gel coat (burning the gel coat is a concern of mine). Please let me know your opinion, im excited to order the buffer and get the boat cleaned up. This buffer will be for personal use only. Ill be using it a few times per year on my boat and maybe once a year on my car. 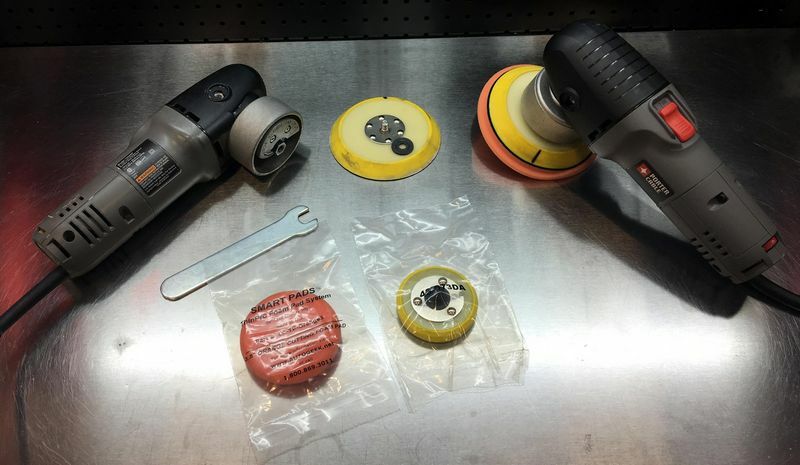 I have zero experience using a buffer and dont want to go overboard if i dont have to, but im not afraid to spend a little extra to get the right tool. Ive been looking at the marine 31 porter cable complete oxidation removal/polish kit as it seems the safest for the gel coat (burning the gel coat is a concern of mine). Please let me know your opinion, im excited to order the buffer and get the boat cleaned up. 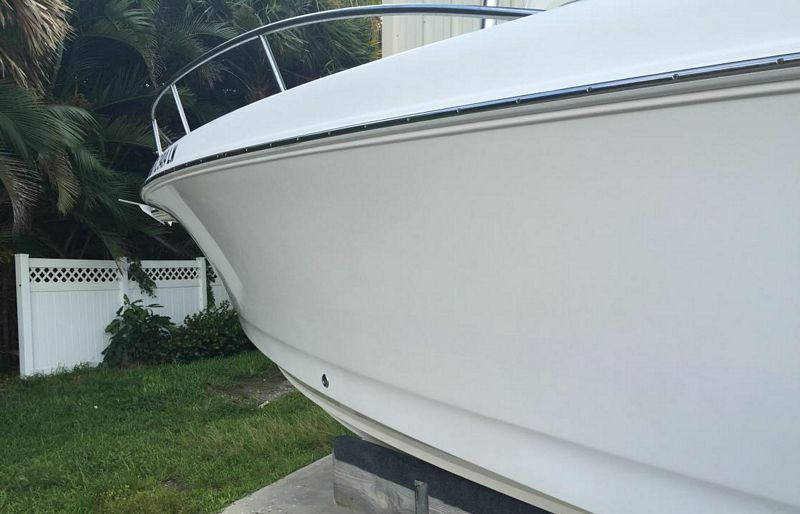 When it comes to buffing out gel-coat boats, my experience is it's incredibly safe as it relates to "burning through" because gel-coats are thick. Car paint is thin and that's where the fear of burning through the clearcoat is valid if a person is not careful or uses to aggressive of products or products. Hang tight while I add your pictures to this thread for easier viewing. The sides and larger flat areas will be easy to buff but getting into corners and tight areas will require more patience or knock them out by hand. Then after you get the boat where you like it simply hit it once in a while with the same product to keep it up. With a one step you go around the boat once. 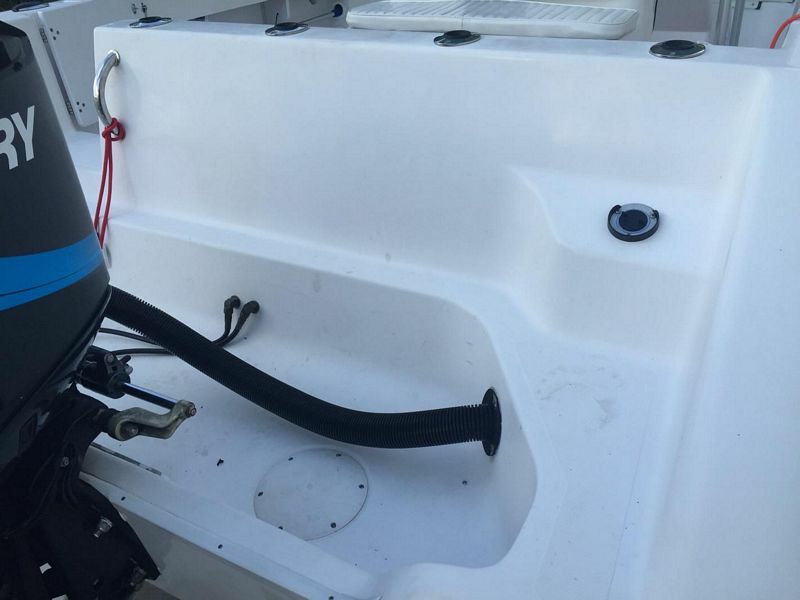 With a two or three step product you go around the boat 2 to 3 times. Generally speaking, doing more steps gets you better results but I'm a fan of one-step cleaner/waxes for their simplicity and time and energy savings and also for white boats since white is a lot more forgiving than dark colors. Also, Gel-coats from my experience don't react well to soft foam pads. I've even seen hard, shiny gel-coats become duller when buffed with soft foam pads. 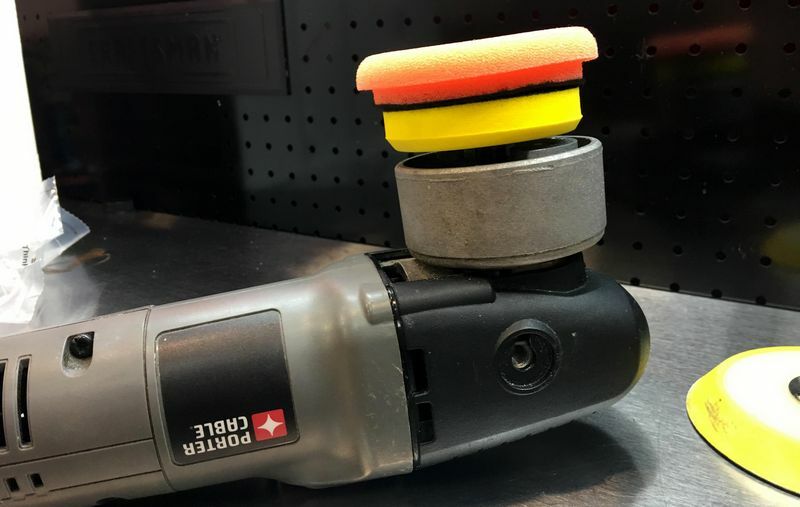 The Porter Cable 7424XP is a stout polisher and my dual action polisher of choice for doing simple work or machine sanding (both in the boat world and the car world). Unlike copies of the Porter Cable, this tool is double insulated and so there's much less of a shock issue if you're around water than the copies. 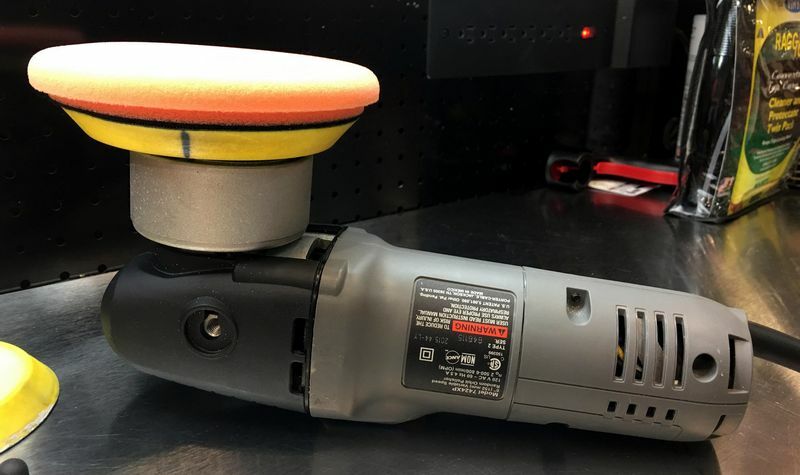 The other thing is THIN pads rotate MUCH BETTER than THICK pads when it comes to these types of simple dual action polishers. Recently, Lake Country, Griot's and Meguiar's all introduced thin foam pads. So if it were me, and I wanted to go with an entry level, in-expensive tool like the Porter Cable then I would go with the Lake Country 5.5" ThinPro pads. The Marine31.com store doesn't show them in the pad section so below I've linked to them on the Autogeek.com store. If you plan on doing all your work on land and water shock is not an issue then the Griot's copy of the the Porter Cable, offers more power and a lifetime warranty. 1. Preserves the factory warranty. 2. Protects the electronics in the tool. Too light of an extension cord is bad for the motor. 3. Less hassling with extension cords. Your choice, just thought I would mention it. When I used to detail full time I preferred to have a long cord wired into my tools than screw around with extension cords. As for the Lake Country ThinPro pads, the grey is REALLY aggressive so I don't think you'll need that one. 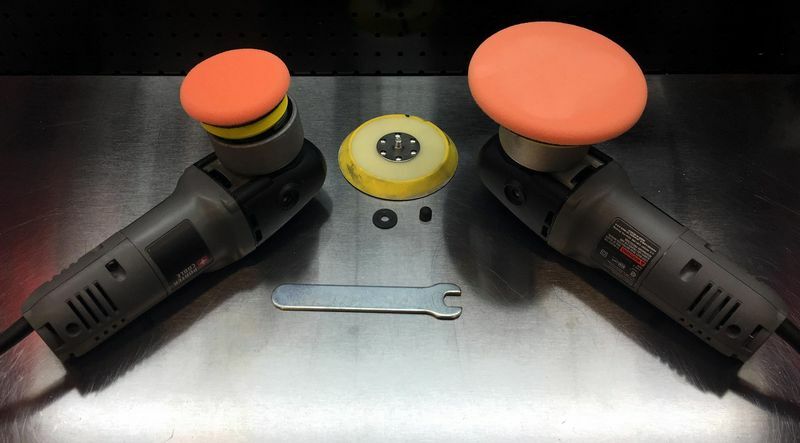 the orange is a cutting pad and the white is a polishing pad. 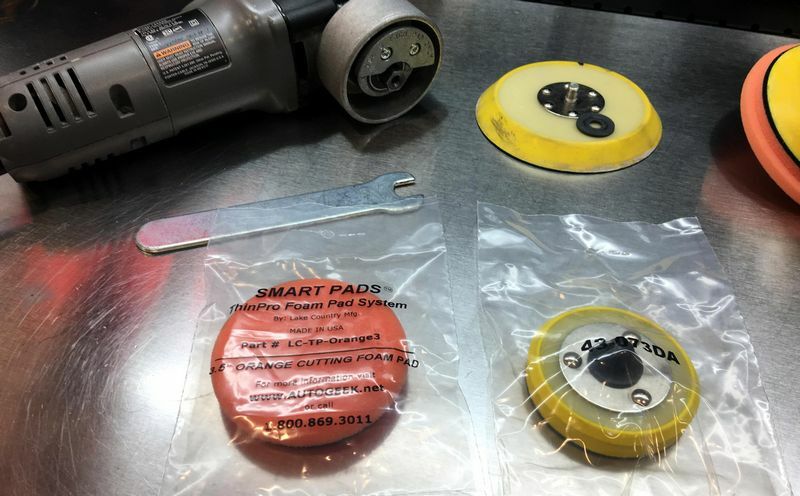 My guess is you can get away with just the orange pads but you want more than one or two because trying to buff out large items like boats and even cars with only a few pads simply wears the pad out quickly from the heat, pressure and violent oscillation action these tools put the pads through. Hang tight, having connectivity issues with my computer. I have some more info and pictures for you. Thanks for all the info Mike! All my detailing will be on a dry surface. If the Griot's polisher is more powerful then I'm in for that. Also I wouldn't mind doing some compounding if I needed to so I can get a nice shine back on it. As for the tough spots on the transom maybe some 3" pads would help? Thanks for all the info Mike! All my detailing will be on a dry surface. If the Griot's polisher is more powerful then I'm in for that. Also I wouldn't mind doing some compounding if I needed to so I can get a nice shine back on it. Sorry for the delay yesterday, had a technical problem on our side. As for the tough spots on the transom maybe some 3" pads would help? Allow me to get back to what I was trying to post before we lost Internet connectivity in my office. This shows you exactly how to use the PC but everything applies to the Griot's too.... right now it comes free with the PC but not the Griot's. This one-step cleaner/wax works really well. Cuts oxidation, polishes and leaves the surface shiny and protected. If the above ends up not being aggressive enough, (but I think it will), this just means you need to get more aggressive so use the same product with the Lake Country ThinPro GREY pads which are very sharp and aggressive. 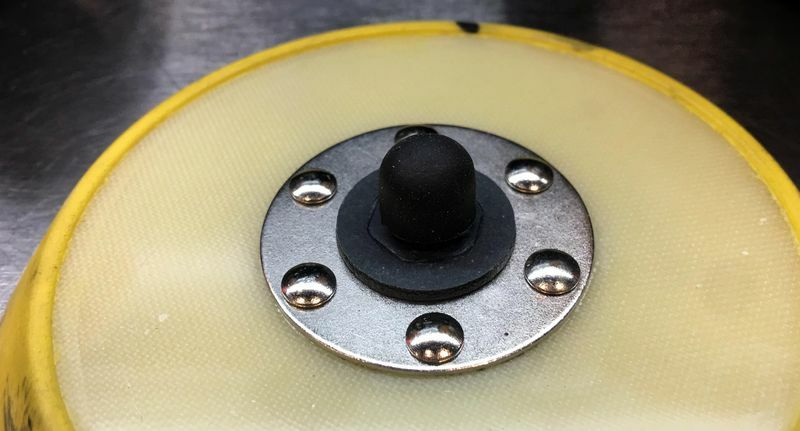 Also you can get the ThinPro pads in 3.5" diameter size and you can get a 3" backing plate to use with either the PC or the Griot's for buffing tight areas. Don't ever lose the compression washer. 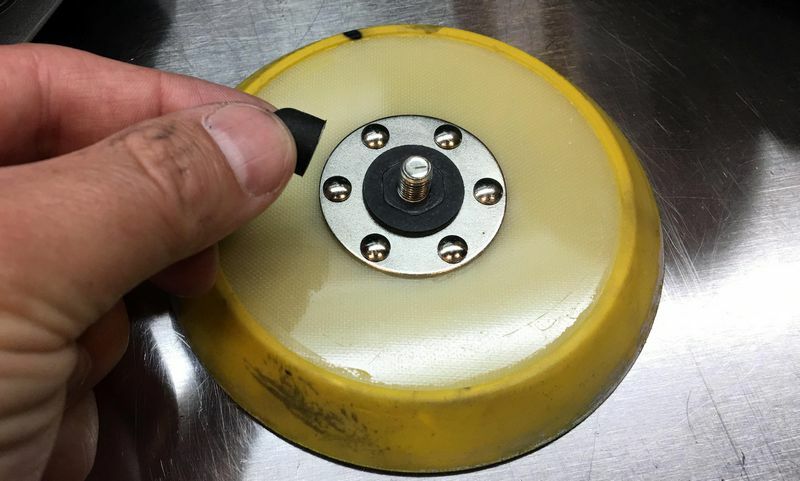 Running buffer with out it will make a horrible sound and create so much more heat at the center of the backing plate it will destroy both the backing plate and the pads. 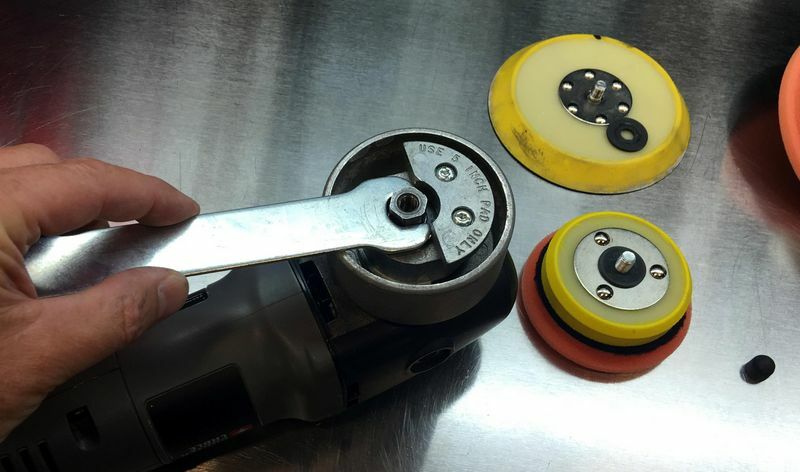 To swap backing plates, you slide the wrench between the backing plate (when it's on the tool), and the housing. IMPORTANT - Insert the tool from the opposite side of the counterweight. Again, same idea applies to the Griot's version of the PC. Place a black mark on the back of both backing plates to make it easy for your eyes to monitor pad rotation. 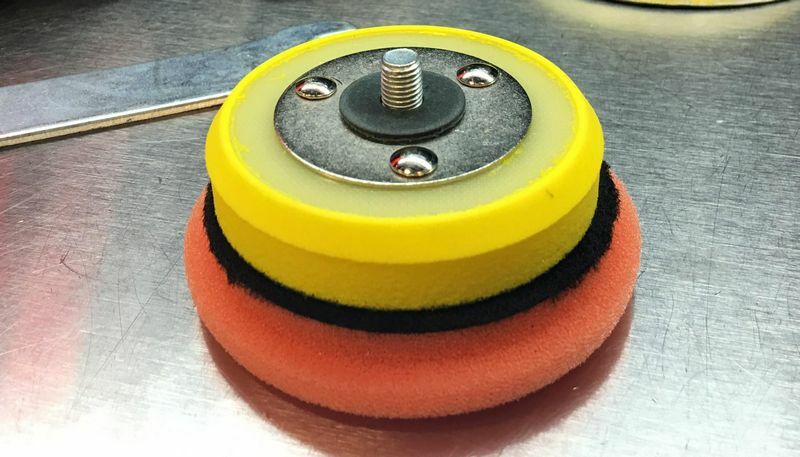 Because these are free spinning polishers, that is they are NOT gear-driven like the FLEX 3401 Orbital Polishers it's possible for the pad to stop rotating if you hold the tool so the pad is not flat to the surface. The black mark makes it easy for the human eye to monitor pad rotation or lack of rotation. 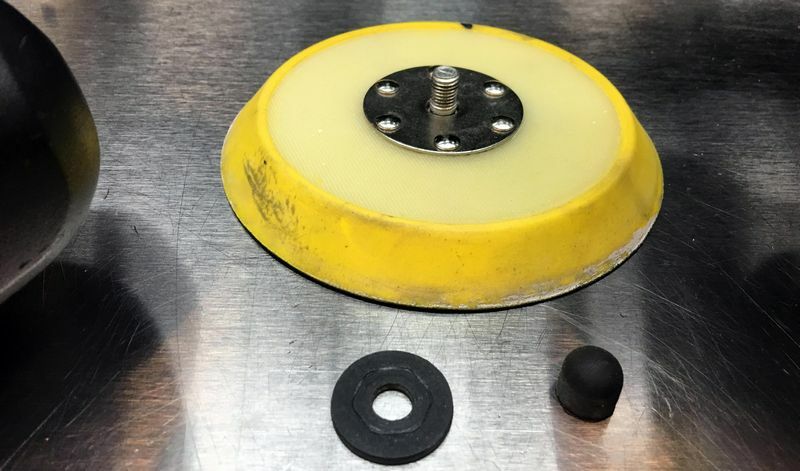 If your backing plate comes with a rubber nut to hold the compression washer in place, don't lose it and use it when swapping out backing plates to keep the washer from getting lost.